Some of you may not know this, but in addition to writing Food Blogga, I also create content for Pork, Knife & Spoon, the blog of The National Pork Board. 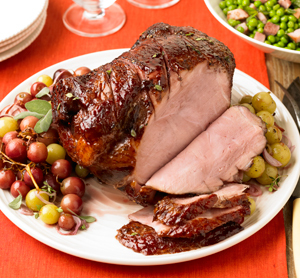 Right now, we're gearing up for Easter by giving away coupons for TWO EASTER HAMS! Want to win an Easter ham for your family? Do like bunnies do, and hop on over to Pork, Knife & Spoon to find out how! The deadline for entering is this Wednesday, March 28, 2012 (midnight PST), so hurry! And good luck! I would be happy to leave a comment, but I don't understand the choose an identity thing! When a blogger has that I am usually anonymous. Do I have to join something to leave my name? No, you don't join anything. If you're a blogger, then you'd put your URL of your blog. You can also just click name/URP and type your name. Hope that helps! Pls be sure to leave the comment over at Pork,Knife & Spoon.